Welcome to the Carnival of Divided Government Quînquâgintâ [L] - Special 50th / Belated 5 Year Blogiversary / Independence Day / Labor Day / Halloween / Thanksgiving / Winter Solstice / 6 Months Late and newly renamed 2012 New Year Resolutions Edition. Yeah, this post is a little late. Frankly, the whole "Blog Carnival" concept is well past its "Sell By" date, eclipsed by Facebook, Twitter, and other social network aggregation schemes. The Dividist Resolves to write a post for the Dividist Papers every day this year. Wait. This is January 2nd. Lets start over. Note to self: Remember to delete this before posting. 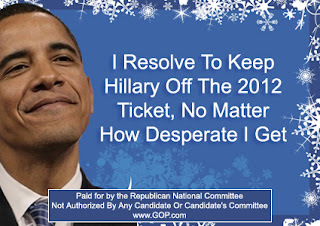 The Dividist Resolves to post at least 20 times per month in the Dividist Papers for all of 2012. One down. The Dividist Resolves to post the Carnival of Divided Government every month for the entire year starting on January 1 2. The Dividist Resolves to play more rounds of golf than the President of the United States in 2012 (The Dividist may already be behind the curve on this one). 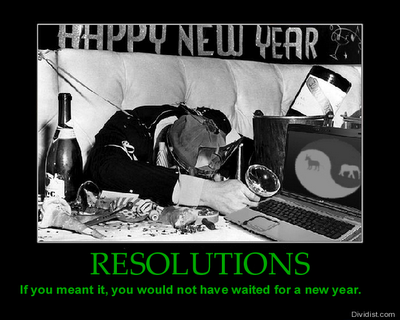 The Dividist Resolves to send a Twitter Tweet sometime in 2012. The Dividist Resolves to include Amanda Drury pictures in more blog posts. Apparently the most popular post on this blog featured pictures of Amanda Drury discussing divided government and "Double D's" (Double Dip Recession - what did you think she meant?). As explained in earlier editions, we have adopted Latin ordinal numeration to impart a patina of gravitas reflecting the historical importance of the series. In this the Carnival of Divided Government Quînquâgintâ (L) - Special 2012 New Year Resolution Edition, as in all of the CODGOV editions, we select volunteers and draftees from the blogosphere and main stream media writing on the single topic of government divided between the major parties (leaving it to the reader to sort out volunteers from draftees). Consistent with this topic, the primary criteria for acceptance in the carnival is to explicitly use the words and/or concept of "divided government" in submitted posts. A criteria that, to our endless befuddlement, is ignored by many of the bloggers submitting posts, which sadly results in The Dividist reluctantly ignoring their fine submissions. Among the on-topic posts, essays and articles we choose our top ten favorites for commentary and consideration. We hope you enjoy these selections, and in 2012 will resolve to not give either party all the keys to the castle, choosing instead to vote to keep our federal government divided. The Dividist will take her thesis further with an early season prognostication. No need to invoke a "filibuster proof" Senate to find a mixed outcome in the pending election. The most likely scenario is that the Republican majority in the House will shrink, but continue to be chaired by John Boehner. With a crushing structural advantage in the Senate races (23 Democratic seats up for re-election vs. only 10 Republican), the Republicans will likely take control of the Senate with a narrow majority. As this outcome becomes obvious in the run-up to the election, Independents will become nervous about once again granting the GOP one party rule, and will gravitate to the incumbent, re-electing Barack Obama on a razor-thin margin. For all the complaints about gridlock in 2011, Americans still trust divided government more than they trust either party. "When it comes to governing, I have long been an advocate of divided government. I believe our system works best when both parties have some skin in the game. But the public persona of the Republicans, particularly in the House of Representatives, is more concerned with being against all things supported by President Barack Obama... America's problems are bigger than the orthodoxy of any political party. We need two political parties actively competing in the marketplace of ideas. A shellacking in 2012 might be the tonic that will unearth the perspectives of individuals within the Republican party who are frustrated by the myopic and derisive approach currently adopted." Okay... So... let me see if I got this right - Byron thinks we need two parties "competing in the marketplace of ideas" but our problems are so big right now that it would just be better for all of us if the Republicans would behave more like Democrats and accept the Democrats view of the world. Or - barring that - if the voters would just reinstate the Democrats back into One Party Rule, at least until - you know - the Republicans learn to start behaving more like Democrats. The Dividist thinks that Byron needs to get that hopium needle out of his arm. "That brings us to Washington. Those of us who longed for divided government to stop politicians in our nation's capital from going to extremes in either cutting or boosting taxes and regulatory levels, never wanted things to be this divided. We don't have divided government, we have dysfunctional government, at a time we can ill afford it." I guess both Allan and Byron wanted to see just the right amount of divided. Not too hot. Not too cold. Just right. The Dividist is sympathetic. Like 95% of Americans, the Dividist would prefer to see less clownish behavior out of our elected representatives and something that more closely resembles constructive compromise. That said, it is important to remember that in the sentence "... stop politicians in our nation's capital from going to extremes", the operative word is "stop". We are at a point where stopping stupidity and extremes is more important than "getting things done." Paraphrasing Churchill, eventually Congress will do the right thing, when all other possibilities have been exhausted. The Dividist would like our leaders to do the right things. Until then, the Dividist will be happy if they are not doing more of the wrong things. "When American voters look at Washington these days, they see dysfunctional government, not merely divided government. A Fox News national poll released Friday asked voters if the scene in the nation’s capital is better described as “divided government working the way the political system was set up to work” or “dysfunctional government working the way it is because of the elected officials currently in office.” By a wide 71 percent-to-21 percent margin, voters say “dysfunctional." This is an odd poll. It sets up the question as if these are mutually exclusive descriptions. It is kind of like asking Do you think the ocean is better described as "wet" or "large". Another odd aspect is the way the question invokes and sets in opposition the design of our political system ("...working the way the political system was set up to work")and the nature of the people holding political office ("...dysfunctional government working the way it is because of the elected officials currently in office"). The Dividist thinks the government is dysfunctional, but he would have been among the 21% minority that thinks the Ocean is better described as "wet" and that divided government is "working the way the political system was set up to work." "US policy has been relatively rational - divided government confers few blessings, but one of them has been that Democrats have managed to prevent radical austerity prescriptions from taking root - a fate that would doom the US to Euroland-style negativity. But the Fed is already in full monetary stimulus mode, and fiscal stimulus ala Congress has about as much chance in a presidential election year as Harvey Firestein does winning statewide office in Texas." "GREGORY: We talk about dysfunction in Washington, and here are the numbers to bear this out. Job approval for Congress at an all-time low of 9 percent, 83 percent disapproval... When you fall below journalists, I think you're in a lot of trouble. But, all serious – all kidding aside, are you not disappointed and embarrassed by those numbers? BOEHNER: Well, David, welcome to divided government. You know, Republicans have the majority in the House, but Democrats have the majority in the Senate, and we've got a Democrat in the White House. We have honest philosophical differences about the way forward. And so it's not a great surprise to me that, that when we get into these philosophical discussions and these debates and we don't agree, people don't like watching that. But my job is to find enough common ground between the parties to do the right thing for the American people." 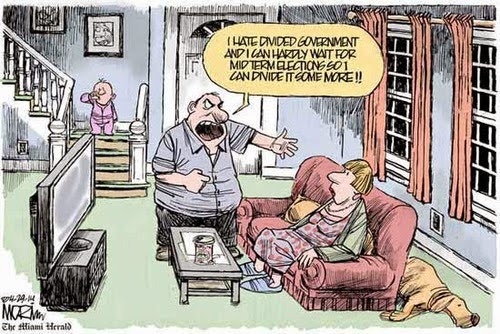 As good an explanation of divided government in action as I've seen. 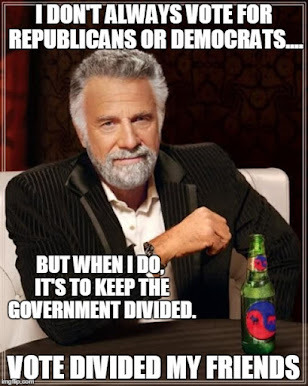 We are a divided country and we've elected a divided government to represent us. Little gets done until a mutually unpalatable compromise is reached. It will happen, but it won't be because Republicans embrace Democratic solutions or vice versa. It happens after they have beaten each other politically senseless and it becomes obvious there is no other solution except a compromise tht no one likes. "On the issues that would be ripe for a bargain between the two parties—entitlement reform, tax reform—there is almost no agreement. Democrats want to increase taxes on the highest earners and shore up the welfare state by expanding it, Republicans want to cut their taxes even further, and “fix” the welfare state by destroying it. Here’s a prediction: If Republicans win the House and Senate -- but Obama remains in the White House –- we won’t see much in the way of deal-making between the two parties. Rather, we’ll see a repeat of the pitched partisan warfare that has defined Obama’s first term, as Republicans fight to dismantle an Obama legacy and Democrats scramble to defend it." No it is not magic Jamelle. It is practical politics. There is never a reason to compromise when either party controls both the legislative and executive branches, believes it has a mandate or believes it speaks for the will of the American people. Divided government forces compromise, not becuase it is magic, but because divided government makes it obvious that there is no other choice. We may need to get through this next election before both parties really concede there is no other choice. So here is my prediction: If we get the outcome Jamelle invokes (Obama re-elected, GOP controls House and Senate), there will be a grand bargain. We'll get it because at that point, it will be obvious, even to our political leaders, that there is no other choice. "While divided government is likely to block partisan projects, it may enable unpopular but necessary reforms. The country needs serious entitlement reform, which means less spending on health and retirement benefits. But neither party seems suicidal enough to play Scrooge solo, so entitlement reform will likely require two-party participation, just like tax reform in the 1980s and welfare reform in the 1990s. Those who think America’s fiscal health needs tough medicine have good reason to hope that the prediction markets are wrong and that America gets divided government." True. Except that part about the prediction markets being wrong. In the exact same editorial Glaeser explains that the prediction markets currently suggest the GOP will take the Senate, keep the House, and lose the Presidency. That is divided government. Perhaps Glaeser should read his own editorials. Asked by RCP what lessons and techniques Obama learned in dealing with divided government that he would take with him into 2012, his spokesman said the president would try almost anything to help Americans make it through a tough time. The means by which he does that working with a divided government, working with a divided Congress, are less important than results,” White House Press Secretary Jay Carney said. “So he’s agnostic on that, I believe, because the focus is helping Americans deal with their everyday problems: their bills and their jobs and their economic security, their health care. That’s what he’s focused on." The results are more important than the process. The Dividist likes the sound of that. Obama will certainly be a better divided government President in his second administration than he was in his first. His legacy will depend on what he can get done under divided government, much like Bill Clinton, who's legacy was determined by what he accomplished with six years of divided government. And with that, we'll conclude this edition. Thanks for stopping by, and if you enjoyed the linked posts (or even if not), leave a comment. Look for the 51st Carnival of Divided Government ûnus et Quînquâgintâ (LI) - Special President's Day Leap Year Day Edition - sometime on or about February 29. Please submit your blog article at the carnival of divided government using our carnival submission form.